A couple of weeks ago we heard that the rumoured HTC One M9 Plus was set to be the same size as the HTC One M9, despite the Plus in the name, with the only real difference being the inclusion of a fingerprint scanner. But according to a new leak from the same source (Upleaks) it actually might be bigger, though not by much. A full specs listing for the Snapdragon variant of the HTC One M9 Plus reveals that it will apparently have a 5.2-inch display, while the most common rumour for the standard HTC One M9 points to a 5.0-inch screen, though 5.2-inch rumours have done the rounds as well. A slight size difference would make sense given the leaked images of the two handsets we recently saw, in which the HTC One M9 Plus is clearly slightly larger than the One M9, so this is believable. Another possible difference is the resolution, as while there's a lot of talk that the HTC One M9 will stick with a 1080p screen, this spec listing points to a WQHD display for the HTC One M9 Plus. The rest of the specs include an octa-core Snapdragon 810 processor with four cores at 2.0GHz and the other four clocked at 1.5GHz, 3GB of RAM, 32GB of storage, a touch-based fingerprint scanner, a 20.7MP camera on the rear along with a second 2.1MP lens, which is likely a depth sensor, a 4MP or 13MP front-facing snapper and a 2840 mAh battery. It's also set to have BoomSound speakers with Hi-Fi audio, Android 5.0.2, Sense 7.0, Bluetooth 4.1 and Category 6 4G for download speeds of up to 300Mbps. 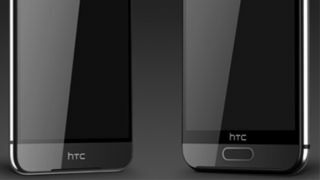 All of which is largely in line with what we've heard about the standard HTC One M9, apart from the fingerprint scanner. However, we weren't expecting the depth sensor to make a return, so that may just be a feature of the Plus variant. There's also expected to be a version of the phone with a MediaTek chipset, but the other specs will likely stay the same. As always this is all just rumours for now, but fairly convincing rumours, given that they largely support what we've already seen. The HTC One M9 has seemingly already been benchmarked.